Chief Minister Mamata Banerjee on Tuesday asked the people of Darjeeling to bring peace to the Hills so that her government can bring in development to the region. Speaking at the first-ever business meet organised in Darjeeling, Mamata said, “We have the duty to see that there should not be any violence. If you want to raise your voice, I have no problem, as our government is always willing to discuss the matter… Just consider me as your elder sister and come to me if you have any problem.” Industrialists Sanjeev Goenka, Harsh Neotia, Mayank Jalan and others were present at the meet, which will conclude on Wednesday. Claiming that she “nurtures Darjeeling more than her own constituency”, the chief minister said, “Earlier nobody took care of Darjeeling. Now, I come to north Bengal twice a month. Sometimes, I cannot satisfy every individual, but collectively we can satisfy more. If you give us peace, we will give you prosperity. That is our commitment and assurance… For this, if somebody has to bell the cat, then let me bell the cat.” The CII, in partnership with the state government and the Gorkhaland Territorial Administration (GTA), organised the two-day business meeting in Darjeeling to boost economic activities in the Hills. “Our first task will be to maintain peace in Darjeeling. If peace is not there, then industrialists will not invest here. Please see that there should not be any violence. If there is violence, then some political leaders might gain, but people of Darjeeling will not gain anything. There should be competition over development as we do not want to see competition over violence,” she said. 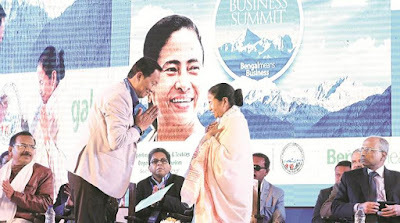 Expressing hope that the CII would extend cooperation in setting up some high-end hotels in the Hills, Mamata asked it to prepare a Plan of Action on how development and industrialisation could progress together. The chief minister also asked the CII to prepare a Detailed Project Report on cultivation of cinchona, orchid and medicinal plants, which have huge market. Asking the Centre to not “divide Darjeeling for some seats”, Mamata said, “I will make only one appeal to Delhi. Let Darjeeling be happy and don’t help anyone divide it. We want to maintain friendship with everyone. We will not allow division of Darjeeling for some seats and political purpose because Darjeeling is our heart and we love its people,” she said. The chief minister also thanked the GTA administration for making the business meeting “successful”. “Thanks to GTA for cooperating with us. Let us work together. Bengal means business. There is tremendous scope for business in tea, tourism, transport, IT, software, food-processing, horticulture, orchid, medicinal plants and other industries. During last year’s shutdown, the hills lost more than Rs 1,000 crore business and the tea industry incurred a loss of Rs 300 crore. So let us start and bring investment in the hills,” Mamata said. The chief minister also announced that the government would set up two IT parks in Darjeeling and Kalimpong, while Kurseong will be developed as an education hub. Mamata asked the investors to explore and identify their field and decide how fast they could transform their plan into action. Tea tourism also could provide a lot of employment opportunities in the hills, she said, adding that places like Sandakphu, Mirik, Kurseong, Kalimpong, Lava, Lolegaon and Tiger Hills could be made more attractive.